"In fascinating and exhaustive detail, May chronicles the generations of three intermarried families and the enslaved people they owned....Deeply researched and vividly written, May’s creative achievement casts new light on the often ignored contributions enslaved people made to American society." "An American Quilt: Unfolding a Story of Family and Slavery, which includes a number of images and a full-color insert, examines the complicity of the North, wrestles with present-day racism, and is a sensitive, thoughtful, and probing look at what’s left to be found when more of the covers are pulled off the history of American slavery." "An American Quilt cleverly weaves together the disparate fields of material cultural, northern industrialization, mercantilism, trade and slavery. Through deeply a researched history of quilter Susan Crouch, May reveals the multifaceted economic and personal relations between northern textile manufacturers and southern enslavers. Moreover, May reminds us that the handmade quilts of white antebellum slave-holding and non-slave-holding women carry unlikely histories, including those of enslaved African Americans whose labor and stories are usually unacknowledged or overlooked in traditional accounts of American quilting." "Do yourself a favor and suggest this book for your book group or quilting bee because it’s the perfect read to discuss with quilters and bibliophiles alike.The breadth and details in this book are as fascinating as the true story that forms the skeleton of the book. May delves into the history and background of not only an unfinished quilt made from fabrics from the 1830s but also the household of the couple who made it. It’s a tangled web indeed that spans from New England to the Caribbean as well as the historical backdrop of both white and slave family life during the era, the slave trade, trade routes between the agrarian south and the industrialized north and everyday details of 19th century life." 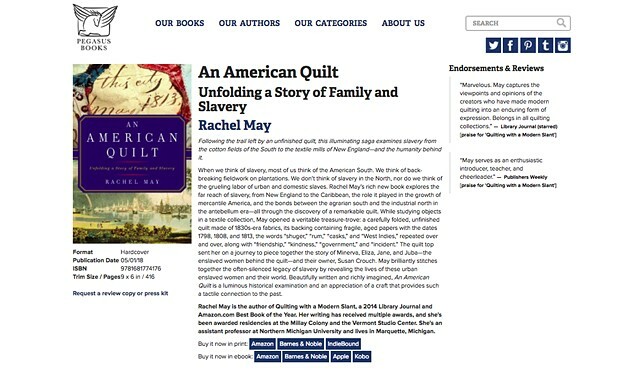 "In An American Quilt, Rachel May is able to draw out the entire story of southern slavery and northern complicity from a remarkable discovery--a quilt top created in Charleston, South Carolina, in the 1830s, and a notebook containing a cache of letters associated with it. From these materials, May weaves an extraordinary account of the families of the quilt makers--a Rhode Island woman descended from slave traders and the slave-holding husband who had brought her South to live. She also is able to invoke the lives of the enslaved population whose labor produced the cotton of which the quilt top was made--which fueled the rise of the New England textile industry. This is a terrific story, well researched and beautifully written, that both reveals the history associated with the quilt top and traces the author's efforts to unearth it." “May follows the footsteps of Linda Lipsett and Cuesta Benberry, who revealed a more thorough picture of the contribution the African American quilt maker. These stories need to be shared over and over again and Rachel May does so brilliantly, intelligently, and with care. The history of enslaved people and today’s on-going racism is not glossed over in this deeply researched and beautifully written text. An American Quilt is a major contribution to the multilayered and complex history of quilt making in America."